Jerry Seinfeld is returning to NBC with a show about nothing but marital strife. Titled The Marriage Ref, it's "not a therapy show, it's a comedy show," Seinfeld says in a network press release. "After nine years of marriage I have discovered that the comedic potential of this subject is quite rich." Seinfeld, whose Seinfeld left NBC's prime-time lineup in May 1998, is the show's creator and co-executive producer along with Oprah Winfrey Show veteran Ellen Rakieten. NBC says Marriage Ref will "feature opinionated celebrities, comedians and sports stars who will candidly comment, judge and offer different strategies for real-life couples in the midst of a classic marital dispute." There's no air date yet. 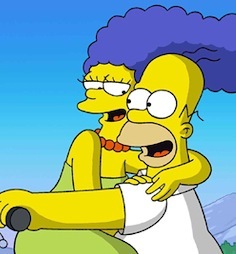 ***Fox's Homer and Marge Simpson so far have done all right without any help from Marriage Ref. So much so that the network has ordered two more seasons of The Simpsons. That will make it a minimum total of 22 seasons and 493 episodes, with no end in sight. ***Another long-distance runner, CBS' Survivor, has been picked up for two more editions that will air in the 2009-'10 TV season. That'll make it an even 20 far-flung, cutthroat adventures for a show that's currently in the early stages of Survivor: Tocantin. ***George Strait will be warming up with a prime-time "ACM Artist of the Decade" special on CBS before joining fellow country music deity Reba McEntire to open the Dallas Cowboys' new Arlington playpen on June 6th. CBS says it'll be taped on April 6th in the MGM Grand Garden Arena in Vegas, with scheduled performers to include Faith Hill, Toby Keith, Tim McGraw, Taylor Swift, Keith Urban and Sugarland. The shebang doesn't have an air date yet.